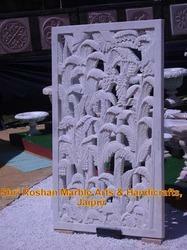 Simple and Elegant Design of Jali. We are engaged in offering our clients a rich variety of marble grills that are exclusively designed and meticulously hand crafted. These grills are available in a blend of designs, texture and form. We also meet customized requirement for our clients benefit and offer our range at industry leading prices. Size 20" x 20", thickness 40mm without border.it is use for sealing jali cover passage area, front of building. best design for joint. Keeping in mind ever-evolving requirements of our respected clients, we are offering a premium quality range of Sandstone Carving Grill. We have attained enormous recognition as a noteworthy producer and supplier of a huge collection of Stone Lattice. Designed by our experts in line with the industry defined norms and guidelines, these offered products are hugely appreciated and accepted amongst our customers for their attractive look and exceptional finish. We also offer an exclusive range of Window Grills which are highly popular all over the world. 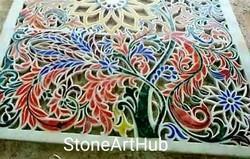 These are further available in floral designs which make them unique from the rest. These Grills are available in thickness from 1 to 2 inches. These grills create a unique pattern when daylight our nightlight falls on these grills. As a customer-focused organization, we are providing a wide array Gas Lava Stone Grills. In addition to this, we are providing these products at very leading prices. We are a most trusted name in between the topmost companies in this business, instrumental in offering high quality array of Stone Window Grill. This beautiful stone grill will give an attractive look to your house. Take this today available at very reasonable price in Jaipur.